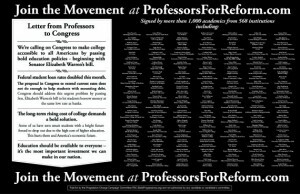 More than 1,000 college professors from 568 higher education institutions around the country have signed a letter calling on Congress to pass legislation authored by Sen. Elizabeth Warren (D-Mass.) 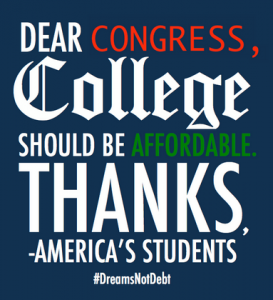 that would dramatically lower interest rates on federal student loans. Student Debt Crisis Team, July 9, 2013– The U.S. Senate is finally expected to vote tomorrow on whether to keep interest rates low on students loans. Because they failed to reach a deal by the July 1st deadline, rates have doubled from 3.4 to 6.8 percent. Unless reversed, this means the average student will owe an extra $1,000 per year of their loan, affecting nearly 7 million borrowers. In light of soaring education costs and a tough economy for recent graduates, now more than ever is the time to keep college affordable. Thank you for making your voices heard!